Last month, several hundred activists tied to a membership organization known as the New Economy Coalition gathered in St. Louis at the organization’s biennial CommonBound conference—the first to take place since the 2016 national election. The conference, held on June 22–24, 2018, and attended by well over 400 people, involved a wide range of half-day and day-long networking sessions, over four dozen different workshops, and two plenary sessions that occurred on the main stage. Video recordings of the two plenary sessions and four conference workshops are available here. The topics were wide-ranging, including everything from the state of social movements in Puerto Rico; to efforts in a range of countries, including Canada, Cuba, Great Britain, Mexico, and Spain; to local struggles for clean energy and against displacement stemming from gentrification. At the conference’s opening, Ed Whitfield of the Greensboro, North Carolina-based Fund for Democratic Communities noted that, “Oppression breeds resistance. But we have to figure out how to build. That brings us here.” The plenary sessions addressed this question by focusing on two themes: owning the moment and owning local power. 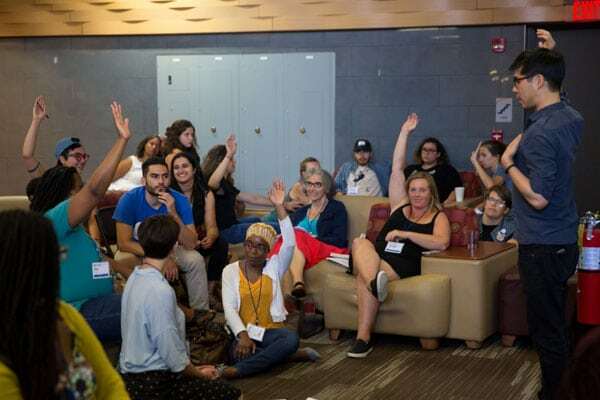 At each session, activists engaged in discussions of how best to move from the current moment where US society finds itself to building a movement that can result in building lasting equity and a more democratic economy. The conference’s opening plenary was titled “Owning the moment” and involved a conversation among three activists: M. Adams, Co-Executive Director, Freedom, Inc.; Ash-Lee Woodard Henderson, Co-Executive Director of the Highlander Research and Education Center; and Makani Themba of Higher Ground Change Strategies in Jackson, Mississippi. Each of the speakers spoke to the local political challenges they face. In Richmond, the leading ones are affordable housing and gentrification. Robinson said that the city, which was roughly 50 percent Black in 1990, is only 22 percent Black today. “The pressures are intense,” Robinson added. Activists in Richmond were able to pass limited rent control, but “it doesn’t protect people renting single-family homes or homes constructed after 1995.” A November 2018 statewide ballot initiative, however, if passed, would give cities like the Richmond the ability to extend rent control protections more broadly. Robinson also said the city needs more cooperative housing and community land trusts. In San Juan, Díaz Ortiz noted that his group shifted their work in the face of Hurricane Maria and imposed austerity from a fiscal control board. “We see culture as fundamental to the work that we do,” he said, even if sometimes immediate needs mean that the most important work is to feed folks or take water to people. This emphasis on local action, even in the face of global challenges on the scale of those faced by places like Puerto Rico, permeated the conference—including the opening plenary, a panel on municipalism, and a session on leveraging local community investment for social change, which involved many of the participants featured here. On this panel, Kemble also raised the theme; “All of the work has to be local,” said Kemble. Fighting global capital has to be local. How do you get people motivated? To me, it comes down to love. We defend and protect the people, places and relationships we love. Our power is based on deep values of caring for each other and the water and the planet. It is so important to build international relationships and intranational relationships.… We need to talk about what those values are and get very clear about that because those relationships and values are the essence of what we are doing. The panelists, however, also noted that while organizing and building local power was important, more was needed. Díaz Ortiz emphasized the importance of building institutions: “We have to develop long-term, working-class institutions that contest power,” Díaz Ortiz said. “Relationships are our strength, but it is also our weakness because those are so hard. We need to build institutions.” For Díaz Ortiz, building strong working-class institutions needs to be a core element of long-term movement strategy.